Lately, a number of people have approached me about a troubling trend in documentary films. Basically, there’s a sense that while documentaries have risen to prominence, so too has a lack of creativity and a somewhat lazy reliance on interesting subject matter. I must say that I’ve been so blinded by what I see as an exciting emergence in nonfiction that I haven’t thought too much about the ways in which stories are being told – at least on the grand scale. Of course, I notice a weak film here or a missed opportunity there, but in general, I find that there’s so much thought in the documentary arena that criticizing these works can only have a counterproductive effect. That said, I’ve been an avid watcher of ESPN’s 30 for 30 series and their recent endeavor into shorts. I was initially excited by seeing these micro films, but to put it lightly, I’ve been disappointed with the majority of them. It’s not that I don’t find these topics interesting, it’s simply that the ways they are told tend to touch on strong concepts without committing to any. 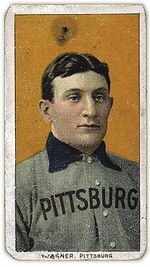 This brings me to the most recent short, Holy Grail: The T206 Honus Wagner, a quick look at the most famous baseball card in the history of the world. Currently valued at $3m, this card has single-handledly transformed an industry and obsessed collectors for years. Most interesting, this has been a rich man’s game where costs have gone up because of the wide-eyed normal men who wish to actually be able to play. At first the film, directed by The Barnicle Brothers, looked to convey the irrational obsession Americans place on something as simple as a piece of cardboard. In some ways, this is an indictment on a culture so caught up in branding that it gets blind to the actual value of almost anything. About midway through the piece, the filmmakers choose to tell the story of the card and its likely doctoring, something that would greatly reduce its value. It’s a fine bit of historical information and, in some respects, something that furthers the argument of vanity in America, however, it loses some of what the film initial built. Holy Grail made me think of a criticism I heard about almost all of the Oscar nominees. The subject was compelling and it touched on greater ramifications, but overall it skirted any real issues. I feel stuffy saying this. Yet, the cursory glance at this baseball card left me wanting more for all the wrong reasons. Now this argument is a bit of double-edged sword because isn’t “taking a stance” precisely what these same documentary connoisseurs dislike about Michael Moore? When it comes to tell a nonfiction storytelling, how far is too far? In regards to Holy Grail, like all of the ESPN documentaries, the story has to serve too many masters to be entirely effective. ESPN has always been in the business of being neutral. In a nation that democratizes just about everything, this company has succeeded by taking little to no hardline stance on the sports that it reports. Sure they may throw a few opinions out there spouted by the likes of Dan Patrick or Stephen A. Smith, but these are generally seen as just that: individual opinions. Sports reporting has been historically biased, yet ESPN has made it news. It’s ambitious to get into the documentary game and I do believe more sports stories should be told in this manner, however, nonfiction is a different beast than news. If the goal of Holy Grail was to indict a nation whose value system is broken then it should have done it. If the intention was to criticize a single company who authenticates baseball cards, then go deeper into the financial horrors of that. Instead, by the end, I felt I had watched the same kind of piece that has been appearing on CNN or PBS for decades. Perhaps the “documentary renaissance” is shielding viewers like me to just how lacking in creativity it really remains. I’m not ready to go headlong into that camp, though I’m seeing that argument more clearly now. For what it’s worth, Holy Grail is worth the watch. You will probably learn a thing or two and it might make you want to dig deeper. An aspect of a nonfiction stories that cannot be denied. So watch and enjoy. This entry was posted in Documentary, ESPN 30 for 30, Films, Movies, Reviews and tagged 30 for 30, cinema, ESPN, Films, Holy Grail: T206 Honus Wagner, Movies, Nonfiction, The Barnicle Brothers, Wayne Gretzky. Bookmark the permalink. Thought provoking article. Questions around non-fiction are continually being debated and theorised. Such an interesting realm of filmmaking. I thought you hit the nail on the head with this: “a somewhat lazy reliance on interesting subject matter”. So many docos do this. And many good docos are simply a focus on something that is just utterly intriguing. But a great doco is a work of creativity that transcends just a simple focus on something intriguing (a great doco can be on something pedestrian). Cheers for the thought provoking read. I will be taking a look at the video you embedded at some stage too. Wow, that’s what I was exploring for, what a information! existing here at this web site, thanks admin of this site. What’s up, I would like to subscribe for this web site to take most recent updates, therefore where can i do it please help out.